Global community. Job creation. Startups as a Second Language. What if @a16z became the new tech-compatible Hollywood 2.0? Initially, when I learned that A16Z was modeling after a top Hollywood talent agency, I thought that it was a great business and customer service move for them and their portfolio companies to have competitive advantage to dominate their verticals. But with Genius and Buzzfeed investments, I am thinking that Michael Ovitz can add a lot more value in the smartphone world of 7B screens. A16Z can be the ultimate Hollywood studio that works with evolving media platforms and consumer demands rather than going to war against them each and every time media tech iterates. Angel Pitch, Venture Capital, and The Internet of Things! We’re having fun this summer! Things are certainly heating up. We have 35 startups in ourAcccelerator Program now. I just read Swerve, a brilliant history of Renaissance book hunters! P.S. We also have Pitch Workshops. Founders Space is BIG on the Internet of Things! ▪ How does this impact your startup? ▪ Why can’t you afford to ingore this trend? ▪ What should your Internet of Things strategy be? ▪ Where is the money flowing and how big will this get? Speakers include top VCs and angels and an incredible IoT startup that’s on fire. It’s being hosted by Pillsbury Law. Need Funding? Come to our Founders Space Angel Pitch and meet our panel of top angels & VCs. This is our major pitch event, and you don’t want to miss it. 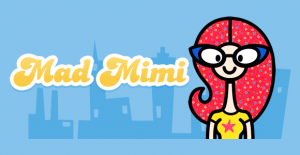 Thanks to Mad Mimi for making this email possible with their elegant and easy service! An e-commerce start-up asked for my thoughts on how the company should be thinking about marketing and what could be done with almost no marketing budget to drive acquisition and purchasing activity. I had to chuckle when I was asked for this input for yet again it demonstrates where in the priority list most business people perceive marketing to be….at the bottom. Most start-ups build a product, get it up and running and have a rough idea of how it will generate money. Unfortunately, most business leaders look to marketing as the tool to help grow the business…after the product is launched. I am using the term “marketing” very loosely here. Marketing is mostly understood as all the tangibles – online, website SEO, paid search, social media, etc. Little regard is given to the core marketing principals of the 4 Ps, for example. When most people hear the words “the 4Ps” they think about the OPP song from the mid 80s and NOT the critical marketing concepts of Product, Price, Place, Promotion. Clearly most people get stuck on the Promotion part….which is putting the cart before the horse. 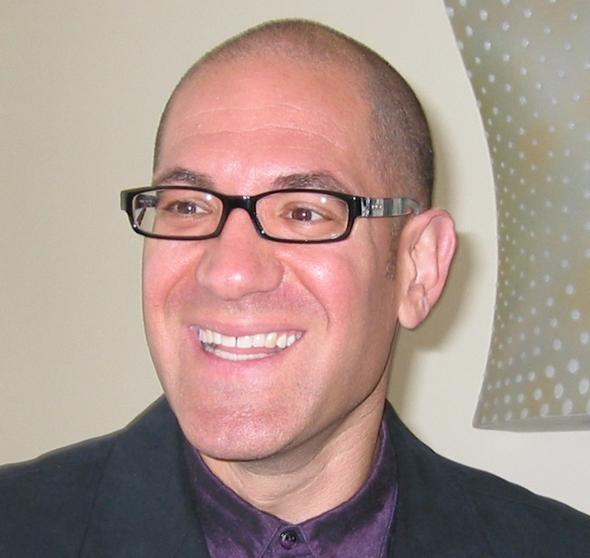 I encourage all start-ups who approach me for marketing help to stop, take a deep breath and evaluate their business and product through the lens of the 4 Ps within the context of a few additional guiding principals; defining the target customer segment (s), understanding why the customer segment wants to buy the product and defining how the customer evaluates/buys the product. Now to the start up leadership who feels time pressed, this sounds like a lot of work to do for marketing. Working through this process and understanding the customer is CRITICAL to the success of the business. Leaders may find their product does not meet the right customer need or that a different customer segment should be targeted. This can be a tough nut to swallow for it means reworking the product that was just launched. Start up leadership must get these marketing concepts right before any marketing plans or programs can be developed and launched with a successful outcome. One of my mentors and managers at eBay developed a structured document called a Unified Marketing Brief that helps guide business units and companies through this form of critical thinking. The document requires debate and thinkin around target audience (segmentation), marketing objectives, key success metrics, competitive industry analysis and market research. Once these elements are addressed, discussion is encouraged around brand and how to position and message the product and key benefits. I’ve guided business units in the e-commerce, identity protection and financial technology verticals through this process with very successful outcomes. Yes, it’s a lot of work and it takes time. However, once completed, business leaders now have a road map to guide marketing planning and tactical program development. I found another great example of a structured approach to startup marketing by April Dunford on Rocket Watcher . 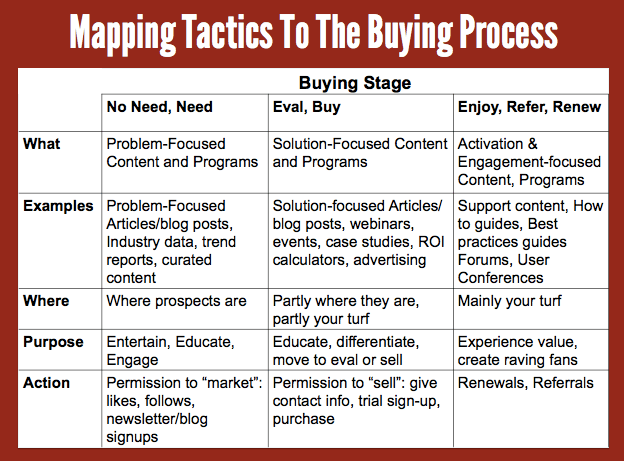 She provides a great approach to mapping marketing tactics to the buying process of each target segment. Now let’s assume that most of this strategic marketing work is in process and marketing tactics are launched. Is the marketer’s job done? Obviously no. The work has moved into a different phase of continuous improvement based on customer feedback. Start-ups must have a mechanism in place to capture and listen carefully to customer feedback. The mechanisms can be customer support teams accessible by email or online chat, twitter feeds or by call centers. Listening to customer feedback is critical…but converting the feedback into actionable product improvements is another. This is a topic for another post! Does your start up have these mechanisms in place? I bet your competition does. My newest book is at Amazon today. It’s already #4 at Amazon for its category. Exciting stuff: potential to disrupt traction phase for startups. I would like to see Project Gutenberg http://www.gutenberg.org annotated by Genius @genius. Free books and summaries accessible to anyone anywhere with a smart phone. After that would be a social layer for students, teachers and fans to discuss and connect. Thank you for the great invitation. I am sharing with my network. Please continue to forward great stuff. Thanks for your call today! You and your business colleagues are invited to tune in to our tech talk radio show on KLOK1170am.com, which covers Big Data, mobile and security on the cloud. It reaches 400,000 Silicon Valley commuters and up to 11 million Indian professionals worldwide. If you know any CEOs who would like to be interviewed, let me know. It’s a great opportunity for them to get free publicity worldwide — and a handy calling card for you. See below for recordings of past interviews. Transforming complexity into simplicity with TruClik & In Context Training Executive VP, Global Business Development, TruNorth Global, Inc. This message contains information that may be confidential and legally privileged. Any material contained in this email falls within the scope of a confidentiality agreement with TruNorth Global, Inc. BELIEF is necessary to succeed in all aspects of life. No matter what we are engaging in, without belief we will not have the desired result we are looking for. –Selling a product or service – The most effective sales people are those that absolutely believe in what they are offering. Energy is transmitted throughout the dialogue a sales person has with a client. Two sales people can be saying the same words, even following a pre written script….those that actually believe in and are excited about what they are offering will always outperform those that are just selling to make a living. –Relationships – Everyone has experienced a relationship that didn’t work out. If someone is in a relationship with a person that does not have common goals, beliefs, values, etc., the chance of the relationship lasting dwindles as the belief in spending a lifetime together just doesn’t seem possible. On the other hand, when you are in sync with someone, believing you will have a long term relationship is just automatic, you don’t even have to think about it. It is effortless and just flows. –Losing weight/getting in shape – This is an area of life so many struggle with. We hear phrases such as “it’s in my genes”, or “I’ve tried, but I can’t lose weight”, etc. If one does not believe they are capable of being in shape, they will find every excuse in the book to support that belief. On the other hand, those that believe they can reach their desired weight, will make decisions and take actions that support their goal. These people make sure they grocery shop responsibly and don’t buy food that would temp them. These people think about what they are cooking, eating, they make conscious decisions to exercise regularly and don’t buy their own excuses. They believe they are capable of reaching their ideal weight and then make decisions that support this. –Sports – People engage in sports everyday, and then some don’t. What is the difference? Some fully enjoy the sport they choose and regardless of how proficient they are, or how busy they may be, they believe it will bring them joy so they want to spend time engaging in it. On the other hand, someone that has no interest in sports, will have no belief in their ability to spend time participating in something they don’t have interest in. –Cooking – Would you invite someone over for a big fancy dinner? If you wouldn’t you might believe you are not a good cook and are not capable of putting on a fine dinner for others. Those that throw dinner parties don’t have to think about it…they just believe they will put on a great dinner. If you are engaging in something and not experiencing the result you desire, ask yourself where your belief is? Do you actually believe in what you are doing? If not, it may be time to course correct, and either learn what it takes to be more proficient, or take a new direction. Getting authentic with yourself in this way removes a lot of underlying challenges such as stress, unhappiness, feeling inadequate, etc. Build your belief, and you build your results…. I believe in taking an active stand for true human potential.